Am writing this article because I just feel I have to tell my story. Blogging for me is about sharing my experiences, good or bad. I don't mean to malign anyone... I just really felt bad about what happened. Since this is the last day of the prize that I actually won, that I didn't claim.... I want to share my story. I am just for.... TRANSPARENCY in contest rules/prizes, especially on the fine print of prizes. I join this blog/write an article contest, sponsored by Century Mall for their Mother's day Celebration. Admittedly, I joined because of two reasons. One, I was excited to share my mother's day story. Two, from the very start I was already eyeing the Pico de Loro prize. I wanted to visit the place with my family. 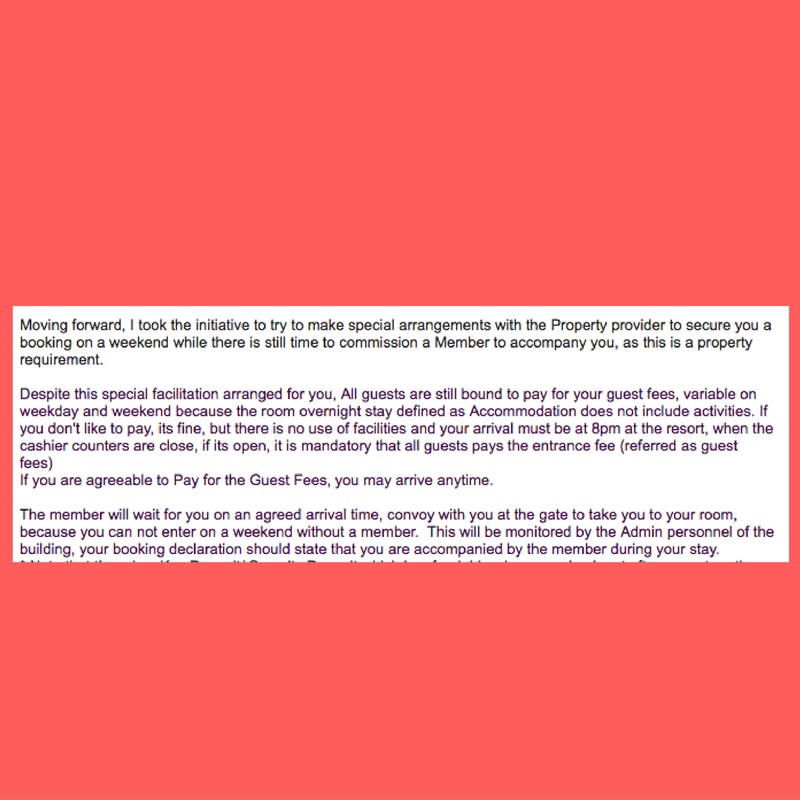 When the email stated that the prize value is up to P10,000, I thought its not just an overnight stay for two, right? Because the published rate of the said resort is just around 5-6k for two. Get my drift? 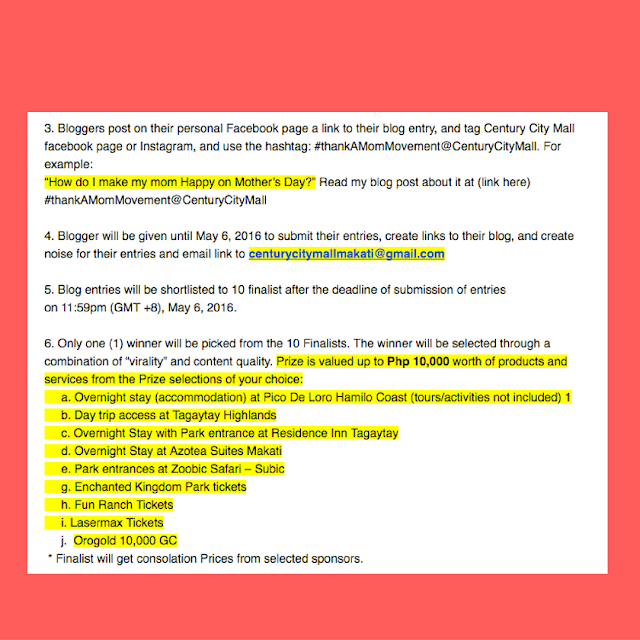 May 18, I received an email from Christine A. saying that "i am one of the winners". Hmm.... am i the grand prize winner or just one of the finalists. Because #6 of the mechanics said, there will only be one winner. They gave me a number to text, for me to choose my prize. Again, I thought, maybe I was the grand winner because I was given the privilege to choose a prize. 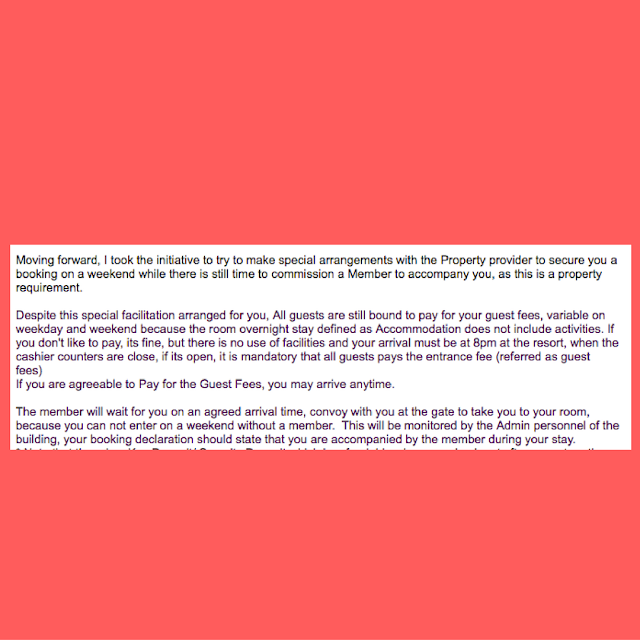 For the first time, I learned about the stay period, and there are guest fees. And most importantly, we need to book 5 days in advance. And we can't even book from friday to sunday. My husband is a regular employee so now he has to file a leaves. This is my MAJOR question now. Why are they telling me all of these restrictions only now. In the spirit of transparency, they SHOULD have revealed these things, when they listed Pico de Loro as one of the options as a prize. Sa totoo lang... had I known of these restrictions, hindi na lang ako sumali. Sayang ang effort. So many restrictions. But then again, I have already published the article, in essence I have promoted their brand. I gave a space on my blog for Century Mall. And being a declared winner, I am entitled to my prize. I settled for this QC hotel, because its near my place. Told them of my chosen booking date. Habang papalapit ang booking date, I felt the urge to call the hotel and asked if I already have a booking with them. And for two straight days, the woman on the other line name JEN, told me that I have NO booking. That irked me more.... and I called Manila Preneur to tell them how unprofessional they were for not handling my booking. Marlyn, whom I talked on the phone, just said, it was her boss who did my booking so she didn't know what to tell me. A few hours later, I received a call from the manager of the QC hotel, clarifying things. First she said, they have no employee named Jen, which she retracted when she called me the 2nd time. Then she kept on explaining that I indeed have a booking, but the papers were not yet forwarded to the front desk. To which I blurted out, may computer naman po siguro kayo. If its in the computer sa loob ng office, eh di andun din sa computer ng front desk." When she heard this, she just upgraded my room to a suite. I just told her, "balikan ko na lang po kayo if I decide to push through with my reservations." At this point, I was really really so frustrated. Yung feeling, porke't blogger lang ba ako, na sumali sa contest, feeling inaapi?" So I finally decided to revert back to my original. I felt, tinanggap ko na nga the not-so-posh choice, they didn't treat me well pa."
Duh? 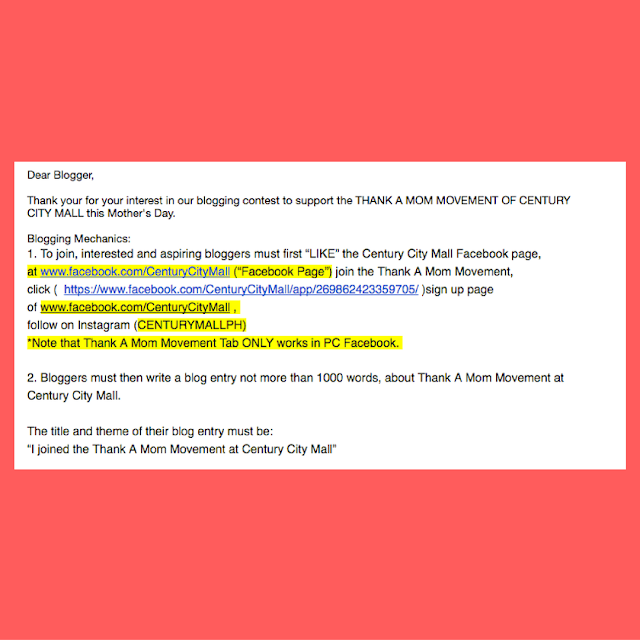 I only received an email from centurycitymallmakati@gmail.com, how would I know if I am dealing with the legit account of the mall or it is a blogger? Being the contest's PR firm, di ba dapat sila ang nakakaalam. A few days after, they told me, that the person who sent the email and contacted me that I won already resigned. Hahaha... what a convenient way to say its not our fault! 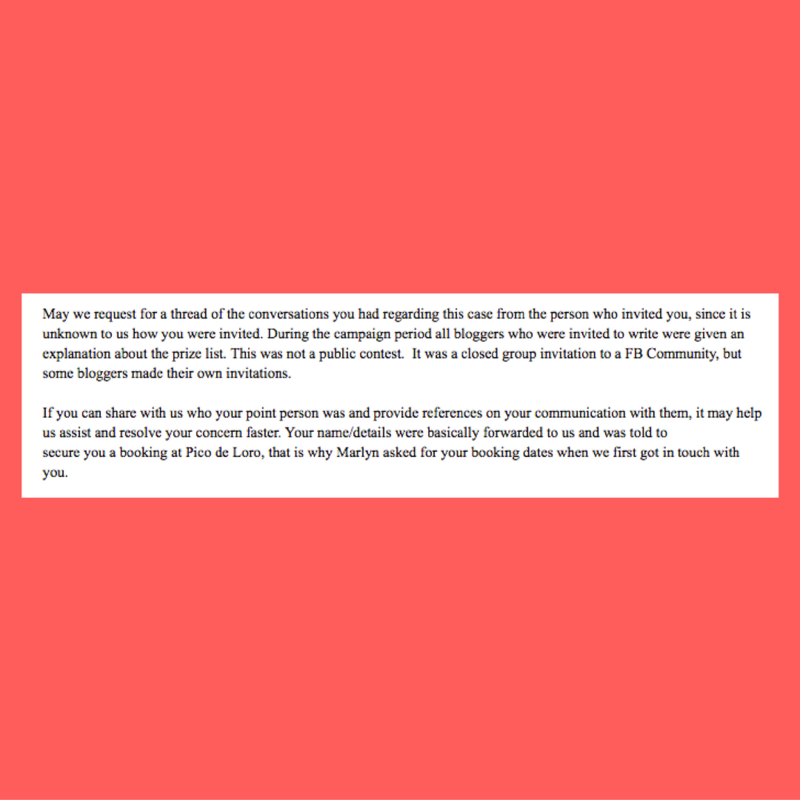 Manila Preneur can't event answer, why they did not disclose the details from the very start. In the end, they told me, that the person who emailed me, who is now resigned, told them she has disclosed the details. So ngayon ako pa ang nagsisinungaling? So now... I am like a PRISONER. Being escorted to the venue. Confined to my room. Hahaha! So this is how it feels to be a winner of the Century City Mall contest! I am sharing this rather lengthy article for you blogger friends to learn from my mistake. I should have asked for all the necessary details of the contest before I wrote my article. Oh well... as they say, there's always a first time! 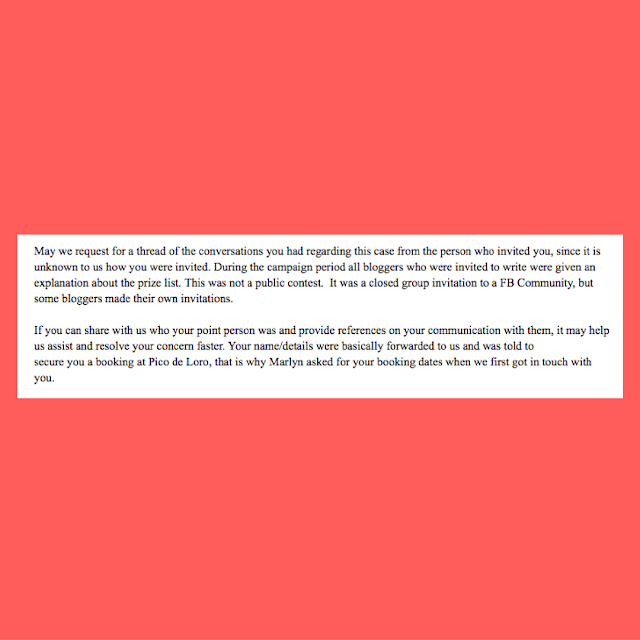 I would like to ask your opinion on this matter dear fellow bloggers, especially those who have been blogging for years. "May na experience na ba kayong ganito?" PS: I learned that a fellow mommy blogger -- Joarra Torres Galang, had the same horrible experience dealing with Manila Preneur. She already received the voucher of her prize, but that is after making kulit, and after she emailed Century City Mall of her horror experience too.